These instructions are for developers who are creating HTML that will incorporated into templated pages within the NLM Main site. The instructions are organized into five main sections as well as information about the Responsive Breakpoint Summary. See the Responsive Breakpoint Summary which illustrates how the seven viewports impact page elements in the context of the entire page. Why needed? : Ensures all pages use the HTML5 Document Type. Displays the webpage in EdgeHTML mode, which is the highest standards mode supported by Internet Explorer, from Internet Explorer 6 through IE11. Specifies the character encoding for the document. Displays the webpage in EdgeHTML mode, which is the highest standards mode supported by Internet Explorer, from Internet Explorer 6 through IE11 and Chrome Frame. Links to all the Styles are required. Location? : Before the </head> tag. Why needed? : Creates a consistent view across browsers. Why needed? : The main style sheet for the entire site. Why Needed? : Style sheet used to style page components which rely on jquery. Location: Before the </head> tag. Why needed: Required so that responsive page components work correctly. Location: After the last content element of the page but before the ending </body> tag. Why needed: Required so that page components requiring jquery work correctly. Why needed. : Required so that page components requiring jquery work correctly. Why needed: Required so that the drop-down menus work correctly. Location: Before the <title> tag. Why needed? : Required so that the drop-down menus work correctly. Code: Contact NLM for information about this code. Required? : Yes Only if the page doesn't use the default JQuery command character, $. Required? : Yes. Only if the page uses the default JQuery command character, $. Why Needed? : Gives users ability to tab directly to page content . Location: Immediately after </head> tag. Why Needed? : Required for all HTML files. Why Needed? : These tags control the basic page appearance. Two options: a fluid width or a fixed width. Code for Fluid width option option. Note: The max width value on this element is 960px. Why needed? : Controls the NIH Logo and U.S. National Library of Medicine text. Why needed? : Controls the Starburst image. Why needed? : Controls the Search box in the NLM header. Why needed? : Controls the NLM Customer Support link in the NLM header. Why needed? : Controls the Social Items icon group in the NLM header. Why needed? : Contains all of the content below the page-header element. There are different classes for different color schemes. Note: Different classes exist for different color schemes which are used for Divisional Branding Bar - Branded Options and Headings. You must use either the Divisional Branding Bar - Empty Option or a specific Divisional Branding Bar Option. All of these options are discussed immediately below this section. Responsive behavior based on page width: All Responsive behaviors for the Divisional Branding Bar element are discussed under the "Divisional Branding Bar with Navigation and Header Image Option" below. Required? Yes, if a specific Divisional Branding Bar option isn't used. Why needed? : The Divisional Branding Bar - Empty Version is only required if a specific Divisional Branding Bar is not used. (See specific Divisional Branding Bar instructions below). Required ? : Yes, if the Divisional Branding Bar Basic option isn't used. Location: First child element within the "main-body" body tag element. The color is controlled by adding a class to #main-body which opens prior to #barbranding. Why needed? : Different classes exist for different color schemes which are used for Divisional Branding Bar - Branded Versions and Headings. Required ? : Yes, if one of the Divisional Branding Bar bar options mentioned earlier isn't used. The color is controlled via the same code as mentioned in the Divisional Branding Bar without Navigation Option mentioned above. Why needed? : This is option adds navigation links to the Division Header. The color controlled via the same code as mentioned in the Divisional Branding Bar without Navigation Option mentioned above. The Navigation option is managed via the css mentioned in the Divisional Branding Bar with Navigation Option mentioned above. Why needed? : This is option a the ability to brand pages with an image located in the upper left of the page within the Division Header. Divisional Branding Bar – Navigation links : Move to left. Wrap text. Location: Second child element within the "main-body" body tag element. Text within the Breadcrumb Bar element will wrap depending on the viewport and amount of text. Location: Third child element within the "main-body" body tag element. Why needed? : Landing target location for the Skip Navigation anchor mentioned above. Location: Fourth child element within the "main-body" body tag element. In order for body elements to display properly, elements must be in a semantic tag (e.g. <p>, <th>, <table>, <ul>, etc. You must use one of the three Body content options discussed immediately below this section. Required ? : Yes, if one of the body content options mentioned below isn't used. Content is contained in a single div tag. Responsive behavior based on page width: Text within the Body content Single Column Option will wrap depending on the viewport and amount of text. Required ? : Yes, if one of the body content options mentioned above or below isn't used. Content is contained in a two div tags. 800 Pixels or greater: Two columns appear on the page. Text will wrap depending on the viewport and amount of text. 799 Pixels or less (601 to 799): Content in div class="columnB grid_X" floats below div class="columnA grid_X"
Required ? : Yes, if one of the body content options mentioned above isn't used. A distinctive display is needed for content in a second column. NLM has defined several Secondary Column Specific Components. 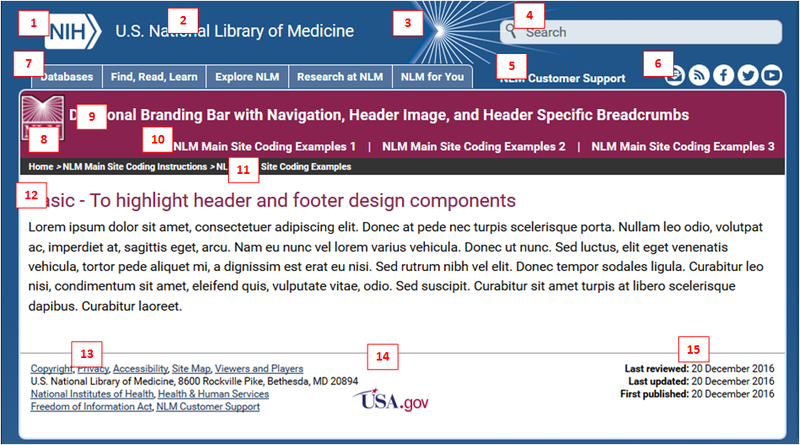 See National Library of Medicine Main Web Site - Coding Examples . 799 Pixels or less (601 to 799): Content in div id="secondary" floats below div id="primary"
Location: Fifth child element within the "main-body" body tag element. Click on this thumbnail which will open the overview image in separate window.